A vampire queen grown powerful with age, Imogen has protected her band of nightriders through the centuries. When refugee vampires from earthquake-shattered Europe seek shelter and sustenance, she’s honor-bound to feed them, by any means necessary. 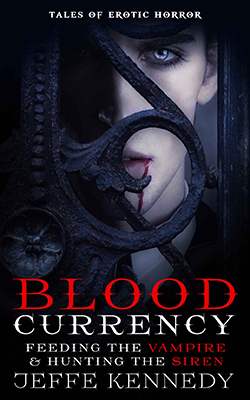 When her lieutenants dump the vengeful human man Kasar at her feet, Imogen succumbs to his masculine vitality and her overwhelming hunger for his blood–and his body.Kasar has survived the breaking of the world, only to discover the vampire queen has slaughtered his sister and her unborn child. With the last of his bloodline dead, only his desire for vengeance keeps Kasar alive. He imagines he can pretend to succumb to Imogen’s seduction–not that he has much of a choice, chained as he is to the foot of her bed–and bide his time until he has an opportunity to kill her. The passion he finds in her arms is unexpected, and impossible to resist. But this haven of desire and satiation could easily destroy them both. Saucy & Sinful Reviews gave “Feeding the Vampire” 4 1/2 quills! Voodoo Bride over at Pearls Cast Before a McPig gave “Feeding the Vampire” a wonderful review! Sparklybearsy gave “Feeding the Vampire” 4 out of 5 sparkles! Read the review. Jaclyn at Dear Author read “Feeding the Vampire” and wanted more! Sizzling Hot Book Reviews recommends “Feeding the Vampire”. Night Owl Reviews enjoyed “Feeding the Vampire”, calling it “a sensual and tasty treat“! Whipped Cream Reviews gave Feeding the Vampire 4.5 cherries! For the Love of Reading gave Feeding the Vampire 4 stars! Tanna at Bitten by Love Reviews gives Hunting the Siren 5-stars!